I'm trying to find the easiest way to localize my app. I'm using sqlite, so I need basically only to switch my database name. Problem is the app name - can it be localized from code or I have to make x apps for x languages, so anyone will have app name in his/hers native language? The latter one seems like already rejected app to me... anyone? I assume you mean the Bundle Display Name that appears on the device's home screen: You should create a localized file called InfoPlist.strings similar to the Localizable.strings file that you use for the usual text snippets. Using this technique you can localize any file you like. Simply add the correct version to your bundle. If you then use [[NSBundle mainBundle] pathFor... you will automatically get the path to the correct localization. We do this for sqlites, strings and sometime even images. You can set the App Name independently for each country iTunes officially supports native language translations through iTunes Connect. Not the answer you're looking for? 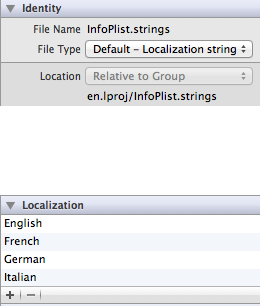 Browse other questions tagged iphone ios xcode localization nslocalizedstring or ask your own question. How to localize bundle display name in iPhone app?